Who are the millennials and why do they thrive at start-ups? You’ve seen them: young people plugged into their electronic devices, tapping away at their laptops in cafes, and discussing their ideas with anyone willing to listen. And you’ve probably dismissed them as young hopefuls. But don’t because these are the millennials. And they are the future. The millennials – young people aged between 18 and 34 – are the largest growing workforce in the world. In the US, for instance, one in three workers is a millennial – this translates into a larger share of the workforce than the previous generation has. In fact, according to US Census Bureau data, Generation Y – millennials – has surpassed Generation X in workforce participation. In the rest of the world, the same pattern is being observed. But the millennials are not just participating in greater numbers – they are changing the way we do business. In particular, they are very active in one sector: start-ups. But why do millennials want to launch start-ups? After all, a lot of start-ups fail, even those that receive funding and investment. Yet millennials are willing and able to persevere: they want to try, fail and try again until they succeed. And they have a combination of qualities that probably, no other generation had before them. At first glance, disenchantment doesn’t look like it’s a quality that drives entrepreneurship. However, it can be positive. The millennials are disenchanted with the previous generations and are not particularly enamoured with the corporate work environment and with the traditional nine-to-five mentality. They’re not willing to navigate office politics in order to succeed. Moreover, they have lived the recession and know how a seemingly healthy economy can hide ailments caused by greed. 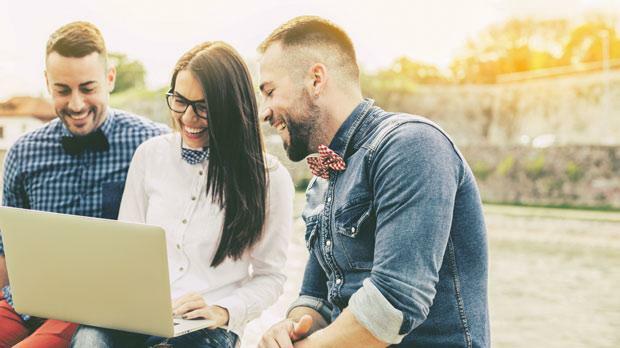 The Deloitte Millennial Survey 2015, which surveyed 7,800 millennials from 29 countries, found that the majority of respondents believe that businesses are focused on their own agendas rather than helping to improve society. Moreover, only 28 per cent of millennials feel that their current organisation is making full use of their skills. It is such disenchantment that is driving millennials to launch their own business. Of course they are idealistic – they’re young. And anyway, idealism isn’t necessarily a bad thing. This belief that they can change the world is what gives millennials the energy to work hard, take risks and persevere until they succeed. And if they don’t succeed, it’s not because of lack of trying. Worldwide, it’s now much easier to start a business. For instance, in New Zealand, which ranks third in the Forbes Best Countries for Business index, you can register a company in one day and start trading in import and export in just 10 days. At EU level, most governments are cutting down on red tape and administrative burden in order to make it easier for entrepreneurs to start doing business. This explains the proliferation of start-ups, the availability of support, and the willingness of venture capitalists and angel investors to trust start-ups with their money. The stereotype that young people are lazy, unmotivated and spend most of their time doodling away on their tablets and posting comments on social media is just that: a stereotype. In reality, most young people are highly motivated. They are interested in their personal and professional development, are creative and value collaboration: it is this combination that makes them innovative in their ideas. Of course, innovation on its own isn’t worth much. But when married to experience, mentorship and support, such innovation adds zing to the economy. Within the traditional context, ambition is frequently presented as greed’s best friend. In Macbeth, for instance, it is ruthless ambition which causes the downfall of the Scottish tyrant and his wife. In reality, ambition can be the passion that accompanies millennials in their pursuit of success. Millennials are not happy with just getting their degree and settling down to a nine-to-five drag. Rather, they want to learn and not limit themselves to one set of skills and interests. They are dynamic in their approach and savour a challenge. Even outside of work and study environments, they want to push their physical and mental limits. This is the secret to their success. Millennials want more from their work. They want fulfilment, personal and professional development, and growth. Actually, they want to be the boss – their own boss. They want independence. And that can be achieved in two ways. The first is job mobility. Until a decade ago, changing job frequently would have made you look unreliable – nowadays, it smacks of ambition and development. The second is by launching a start-up – if you have a great idea, get the support you need and take it to market.